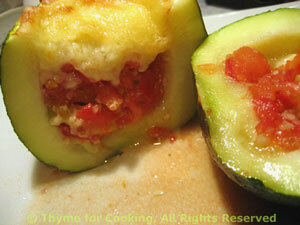 Baked 8 Ball Zucchini (Courgette) Stuffed with Tomato, Thyme for Cooking. The squash I used were about the size of a tennis ball. I mixed a bit of Parmesan and breadcrumbs with the tomato to soak up some of the juices from the squash. If yours are larger, just do 1 and divide it. Cut the stem end off of the zucchini. With a small spoon scrape out the seeds and flesh from the center, leaving a shell about 3/8" (1cm) thick. If they don't sit flat slice a bit off the bottom. Chop the tomato into small chunks. Put the tomato, garlic, paprika, basil, Parmesan and bread crumbs into a small bowl and mix well. Spoon tomato mixture into the zucchini, pressing it in to fill. 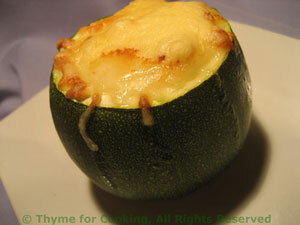 Put the zucchini into a small baking dish, cover with foil and bake, 400F (200C) for 20 minutes. Remove from oven, uncover and carefully sprinkle cheese on top. Return to oven and bake until cheese starts to brown, about 10 minutes longer.